I must admit that I was drawn to making this because it had the word “summer” in its title. With frozen corn, canned tomatoes and fresh produce available even now (zucchini, spinach, red bell peppers and cilantro), you could almost imagine was made in the summer. 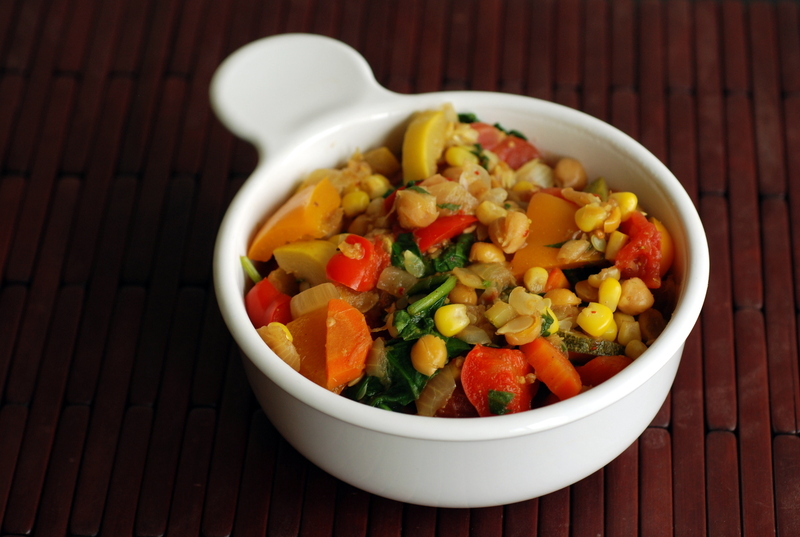 This is probably one of most colourful curries, due in part, to all the rainbow of colours from the vegetables. Rob and I (very briefly) considered taking our bikes out this weekend (we skipped right over snowshoeing) but while the temperatures are nice, the roads are littered with salt, sand and even some small snowbanks. I am kind of hoping that once we return from our trip, spring will be here for real. Especially since I am already planning/imaging what I want to plant in my garden pots for the summer. I have missed my forest of fresh herbs. I am sharing this with Vegetable Palette, Cooking with Herbs, and In My Veg Box (zucchini). 1. In a large pot over medium-low heat, add oil. Add onion and cook for 5 minutes until softened. Add garlic, ginger and salt and cook for 1 minute more. Increase the heat to medium and add the cumin, coriander, cinnamon, turmeric, fennel, cardamom and chili flakes. Stir 1-2 minutes, until fragrant, taking care to not allow it to burn. Add the carrots and deglaze with 1.5 cups of water. Cover and allow to simmer for 3-4 minutes. Stir in the bell pepper and zucchini, cover and cook for 5 minutes more. 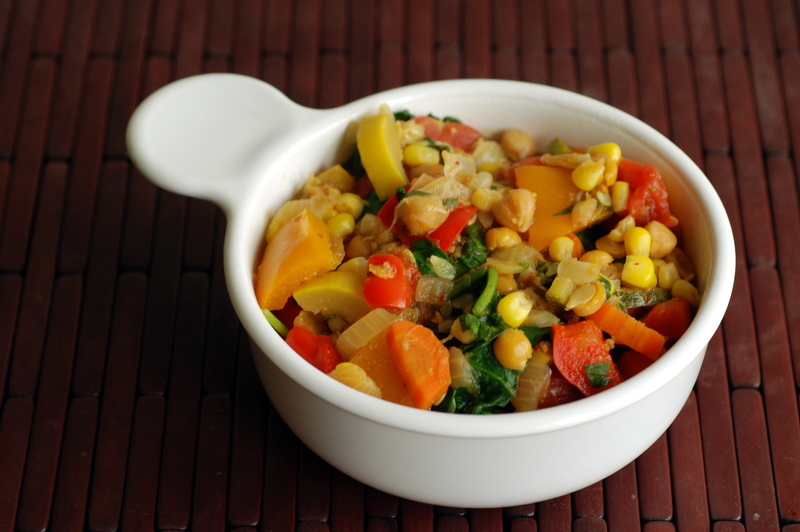 Stir in the tomatoes, corn and chickpeas. Cover and cook for 5 minutes more. Stir in the spinach and cilantro and continue to stir until it has wilted but is still a brilliant green. Add lemon juice and remove from heat. Serve with brown rice, if desired. This looks incredible! We get so many of these veggies in our CSA in the Summer, and after we’ve made all our favorite recipes we’re at a loss at what to do with a million pounds of tomatoes, zucc, and peppers. There’s only so much ratatouille a person can eat, you know? I’m bookmarking this recipe for sure! I love all the colours in the beautiful curry – and I can imagine it is even more cheering after a chilly winter – sandy gritty roads don’t sound like fun for riding! Beautiful colours. There are a lot of different vegetables here, yet it’s still easy. I live in Singapore, where there is no winter. It’s surprising that you start to miss it, at least some aspects. For example, I am intrigued by snowshoeing and would love to try it! The colours are so lovely and warming. I would be happy to tuck into this some day soon. thank you for sharing and supporting Vegetable Palette Janet, the round up should be up at the beginning of the month. Hope you will participate again. So colourful and bright what a wonderful recipe! 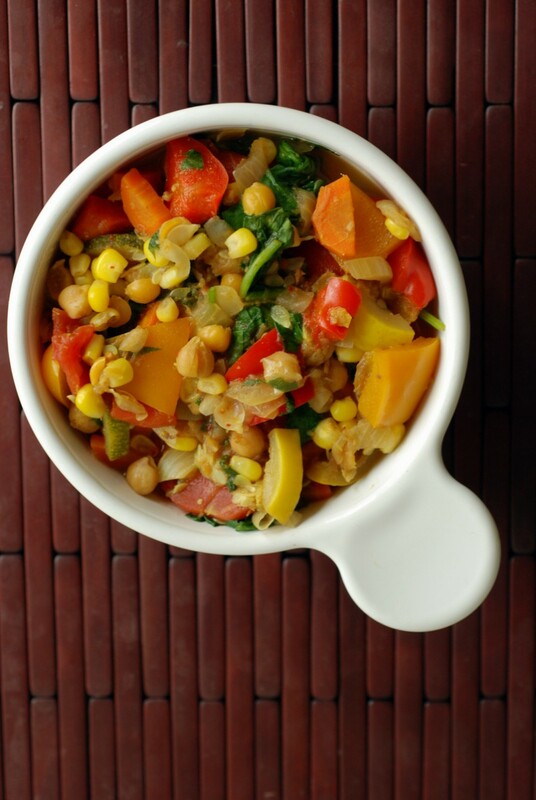 love the colours in that bowl, what a great recipe too, thank for linking up with In My Veg Box.